All my life, she’s been my spiritual mentor. A spiritual giant really. She’s been my Sunday School teacher and my Bible drills instructor. We’ve read a yearly Bible reading plan together. She served as the women’s ministry director at her church the same time I held the same role at mine. Often, when we talk on the phone, we dive into deep theological waters. We love Jesus and his church. She knows all the ways I’ve been exploring the Christian faith. I’ve been learning new-to-me spiritual practices and visiting churches who worship differently than I do. While I think an individual’s local church should remain a priority, my faith has also grown by visiting other churches occasionally. I’ve even discovered new things I can bring back to my church to enhance our worship experiences. Last summer, while on vacation, I talked Mom into attending Catholic Mass. We’ve never been Catholic; my mom still attends a Southern Baptist Church, and I am now a member of the Reformed Church of America. I took her and my daughter to Mass because I find it meaningful to worship with my Catholic brothers and sisters from time to time. Toward the end of Mass, the Priest prepared for Communion. My daughter has gone to Mass with me before, but this was Mom’s first time. We stood up when everyone else did, but rather than head out the back door, as my daughter and I know to do, Mom got in line to receive Communion. Mortified, I grabbed her arm and ushered her out of the church. Mom didn’t know other believers can’t take Communion with Catholics. They believe in transubstantiation, (the conversion of the substance of the Eucharistic elements into the body and blood of Christ at consecration, only the appearances of bread and wine remaining). As Protestants, we don’t believe this is quite what’s happening at the Lord’s Table, so we may go forward to receive a blessing from the Priest , but can’t take part in the Eucharist. What would my mom have done when she got to the front? She didn’t know about crossing one’s hands in front of her chest to signify she’s there for a blessing. Would the priest have refused her? Do we look Protestant? Awkward. Maybe just reading this story makes you nervous, and you weren’t even there! It’s uncomfortable to stretch our faith wings. We sit in the little nests of our own denominations, not flying around much to learn from other faith traditions. I believe there’s more of Jesus to be found when we leave our nests and soar. Believe me, I was uncomfortable the first few times I visited a Mass too. Also when I attended a Lutheran church and discovered I could drink actual wine for Communion. At my first Sixth Hour prayer service with the Orthodox, I wondered why others knelt and kissed a framed picture of Jesus set on a stand at the entrance to the room. My friend and I went to hear Christian author, Lisa Bevere, speak at a local church last fall. When the worship leader told the large crowd to spread out across the sanctuary, making room for worship, and as they swayed and raised their hands, we looked at one another with hesitation. 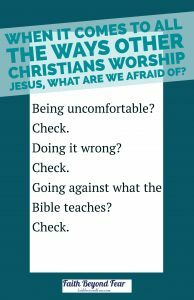 When it comes to all the ways other Christians worship Jesus, what are we afraid of? Going against what the Bible teaches? We have a responsibility to familiarize ourselves with Scripture to know if a church we’re visiting is doing something counter to what the Bible teaches. I’ve also learned to trust the Holy Spirit’s guidance in these situations, but there’s a difference in his conviction and our discomfort. Practice discernment. Finally, in all the churches I’ve visited, I have never felt unwelcome. Most of the time, I am left alone to experience things on my own. Occasionally, though, church leadership and members alike have introduced themselves and answered questions I may have. In the Catholic church, I know the satisfaction of dipping my hands in holy water. The musical chanting at the Orthodox church is amazing. With a full heart, I remember the toddler in her mom’s arms at the non-denominational church, and how they received Communion together. The time of silent prayer, when God spoke so loudly to my spirit, among an ecumenical gathering of writers. The opportunity to witness a dad baptizing his elementary-aged son. Don’t miss out on these Christian experiences because you’re fearful. There’s more, much more, of Jesus to be found among our church traditions. 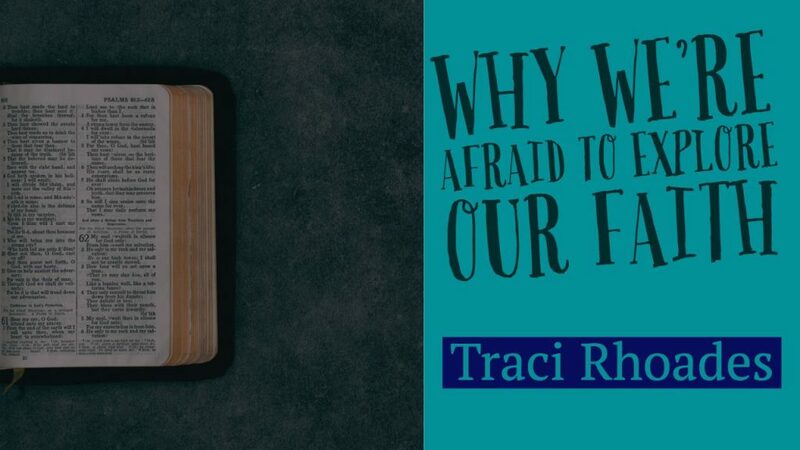 Traci has a faith-based blog, Traces of Faith. In addition to writing articles, she manages the social media accounts affiliated with her blog. Her work has been published in Patheos, CBE International, Her View From Home and The Mudroom Blog. 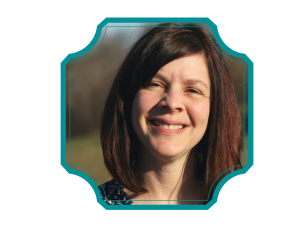 She is passionate about church unity and helping believers develop a better understanding of Christ’s church across cultural and denominational lines. She’s blessed with a husband and one daughter – and if you include their dogs, cats, pigs, guinea hens, and chickens – then there are a lot more blessings to count! You may reach out to her on Facebook, Twitter, Pinterest, and Instagram. We can worship so radically differently, can’t we? I love that you have had such a varied experience. Milton, That about covers it, doesn’t it?! I appreciate the vast experience you bring to the conversation. Spirit led for sure! I was encouraged by your description of your mother as your spiritual mentor. What an amazing legacy she is passing down. From the sound of it, your daughter will grow up and be able to say the same of you. Beautiful post. Stephanie, It’s the cry of my heart, that I can be a spiritual mentor for my little girl. That she might realize more and more the depth and width and height of God’s boundless love for us. Thanks for your kind words! I went to a Catholic mass once, because my husband was raised Catholic. He didn’t tell me I couldn’t get communion, so I went up. I was unsure what to do and the priest was starting at me, so I just grabbed the water and moved on!!! We still joke about how I stole from the Catholic Church! This is such an important piece though. Often we stay in our comfort zone, and it’s hard to expand our faith when we stay put! What a good story! I’m sure God knew you didn’t mean to “steal.” 🙂 You bring up an important piece. When we stay in our comfort zone, I think we can almost fall asleep there. Like our favorite recliner. It’s only when we wrestle, wander, explore our faith in some way, that it stays aflame. The Church after all, is one. As long as we’re like the Berean Christians, and confirming with Scriptures, we should be extending hands of fellowship. Our prayer these last days should be for the unity of the Church. Thanks for this post, Traci. Blessings to you. I agree with every word you wrote here. Often, we spend so much time in our own small church bubble, and forget the call from Jesus and Saint Paul to be one church. I’ll join you in praying for this very thing! What a beautiful post! It reminded me of the time I spoke to the women at a Methodist church and I was asked to administer the communion. Being Non-Denominational mixed with a bit of Southern Baptist, I quickly saw they did things differently. However, I jumped in and did as I was asked. I stood up front, offering each woman the grape juice and bread. As they dipped the bread in the wine, I said, “the body of Christ given up for you.” I said this to a number of women, at first I was just following orders, then suddenly I saw each woman as precious in God’s eyes. The words I said over and over became tender words of Jesus speaking to each lady with love. It was a powerful moment. As you said, we can learn much from others if we are open. Marcie! Yes!! We take communion that way at our church now and it is so life-giving. I’m glad you took a chance and jumped right in. Marcie, what a beautiful image your words created in my mind! I love when we get glimpses of others as God sees them. So beautiful! Love this! What a great point that attending churches that worship in different ways is growing for our faith. As long as – like you pointed out – we examine the Scriptures so we can understand what lines up with God’s truth! Emily, A part of me hesitates to encourage all believers to do this because there are false teachings to be aware of. The more I consider it, though, I feel as if we’re responsible for studying Scripture and asking God for discernment. There’s a lot to learn if we’re discerning! That’s a beautiful description of your mother. Your blog post reminded of the fact that we do things differently in different church communities, but that this shouldn’t take up much of our time. I like to focus on the big perspective. I like the thought that what’s going on in a church can be confusion; it’s a strength, not a weakness, as I see it. A church room should be different from all other rooms. Thank you for sharing your thoughts here. I was encouraged by reading about you and your mum. Big perspective, I think we can be fearful of confusion. We long for faith to be black and white, and it’s just not. 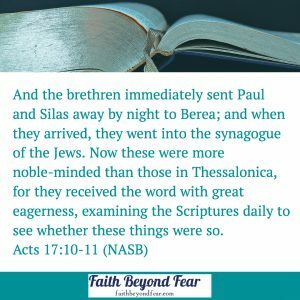 One of the biggest surprises I’ve had in learning about other Christian traditions is they can often point to Scripture to explain their activities. It’s a matter of interpretation. Thanks for sharing your thoughts here Edna! Such an important message! There can be a lot of danger when we stay in our own ‘bubbles’ and not explore and/or seek to understand others. That definitely includes how other Christians worship and do church. And criticism can creep in too, of the way other’s do church which can cause division among fellow believers. I grew up in the Catholic Church, and though I don’t attend it now I’m still drawn to quieter services and hymns, and overall reverence. This has spilled over to ministries I lead where we quietly soak in scripture. God takes us on amazing journey’s to grow us, doesn’t He? Lynn, I appreciated how you look at the other side of the coin, the negatives that can take place when we stay in one tradition exclusively. I’ve brought so many new practices into my faith walk by exploring! This was a rather interesting post. I never knew there were churches that used actual wine for communion. I think we often accept the practices of our church without giving it much thought. We should definitely question its practices to ensure that it lines up with the word of God. It was a Lutheran Church that offered wine or juice. I don’t know if all do that. One of the biggest gifts exploring my faith has given me is a desire to understand what and why I practice faith as I do. There is more common ground than we think! I love this post. This message is so important for the Church today. We really need to get over ourselves and the idea that our way is the only way to honor God. I visit my son’s Catholic church a few times a year–and I consider his priest a dear friend. Thanks for spreading the love of Christ in a creative way. Nancy, I am in complete agreement – we need this as a Church. As I’ve studied Judaism, I discovered they have a much greater tolerance for differing opinions. Interesting to consider. 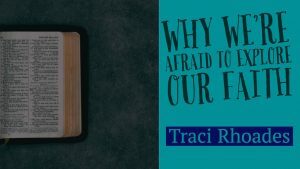 Traci, I loved that your article encouraged people to attend different churches and churches within different denominations. We can learn so much about ways to serve and worship by participating in other’s services. We have moved around a lot and as a result attended many different churches, in a number of different denominations. I, like you, have learned so much about how other church worship and in every church there were beautiful aspects to their service and worship practices. I too loved the liturgical aspects in the Catholic and the Anglican. I love hearing different forms and types of worship music. I deeply enjoying hearing different preachers and their perspectives. It has been both informative and enriching to learn about the dffierent theological beliefs and practises. And through these experiences one learns to be thoughtful and questioning and discerning about what one believes and how one is drawn to live out and practise their faith. Thanks for your great post! Anne, Moving around forces us to experience this kind of thing to a certain degree, doesn’t it? That’s part of my story too. I loved your outcomes – discerning and thoughtful and questioning. All true! Yes! Excellent thoughts! I think it’s so easy to get comfortable with sameness. Some of the best times of spiritual growth in my life have happened when I’ve been challenged to worship in a new way, do church in a new way. It’s wonderful you took your mom and daughter to experience it. Thanks for sharing! I’ve found the same to be true, the more out of my comfort zone I go, the deeper the experience has been. My mind is blown again and again! Thanks for sharing your thoughts on this subject. I love exploring other churches as we can learn so much about the good differences and those things that are not bible based. Yvonne, It has made me study my Bible and other faith-based books a ton more. I needed to know the difference between unbiblical and only different from me. I have loved this part of my faith journey! Our daughter-in-love is Catholic. Son is not Catholic. Son and daughter-in-love were married in Catholic church. They have their differences in church but are a happily married couple and have blessed us with our first grand baby. We have learned about the Catholic church from our daughter-in-love. Melissa, I grew up knowing a few couples like your son and daughter-in-love. It’s very doable and I love it when they can learn from one another. I’ve been so pleased to feel a new intimacy with Jesus as I learn new-to-me things that are often thousands of years old in the church. It’s a matter of getting past the discomfort.